Squamous papilloma of the oral cavity is usually pedunculated. 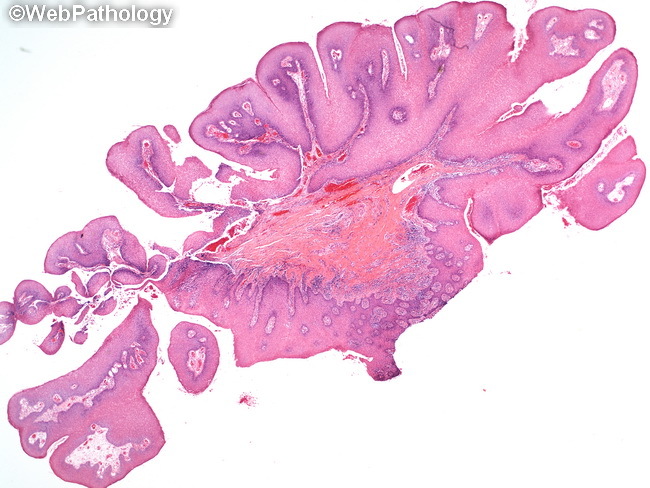 It is composed of numerous finger-like papillary projections lined by keratinized stratified squamous epithelium with fibrovascular connective tissue cores. Lesions with excessive keratinization appear white clinically. The squamous epithelium shows normal maturation pattern to the surface. Some cases show basilar hyperplasia and increased mitotic activity which should not be mistaken for low-grade dysplasia. Koilocytes may be present in superficial layers.